This CD supposedly contains all of Lutosławski’s piano music, his solo piano works at any rate. What is not included are his two most well known, and arguably greatest compositions for piano, the duo-piano Paganini Variations (or later piano and orchestra version) and the marvellous Piano Concerto. There is one piece here, “An Overheard Tune,” written for piano four hands that Corinna Simon plays by overdubbing the parts. I confess I was unfamiliar with any of these solo works, while the Concerto and Paganini Variations are two of my favorite Lutosławski works. I assumed this was the only recording of the pieces until I read Brian Reinhart’s favorable review of an earlier disc by pianist Véronica Briel on Dux (review). Not having heard that, I will keep most of my comments to the music itself. That said, I have nothing but praise for Corinna Simon’s pianism. The 1941 Two Studies show a rather different side of the composer with virtuosic piano writing that must be challenging for the performer. Corinna Simon in her notes to the CD is reminded of Chopin’s Etude Op. 10, No. 1 at the beginning of the first study, marked Allegro. Both studies are quite modernistic and have something of the percussiveness of Prokofiev in his motoric piano writing. They would be a fine addition to any piano recital and ought to receive greater exposure than they have to date. Likewise, the more mature Invention, a dialogue between left and right hands, holds interest with its meter changes throughout its brief duration. The three Pieces for the Young, which require the chops of a rather accomplished pianist, are also attractive. The first, a “four-finger exercise,” is a brisk and dissonant etude, reminding me of both Bartók and Prokofiev. The second is a slow air with a simple theme borrowed from Brahms’s famous lullaby, but with Ravel-like harmony. The third is a march, recalling similar works of Prokofiev and Shostakovich. The earliest work on the disc is the Piano Sonata Lutosławski composed as a conservatory student. It is by far the longest piece, lasting a half hour, and is quite impressive for a 21-year old. It is the most derivative of the piano compositions, with the first movement very impressionistic in the manner of Debussy and Ravel. The second movement, Adagio ma non troppo, with its solid, block chords projects real power and is more original than the first movement. The finale, with echoes of Ravel and Szymanowski, is a bit hectoring and repetitious, but ends quietly. In all of this music Simon has the technical mastery and captures the mood of each with obvious enjoyment. The recorded sound, too, leaves nothing to be desired in its clarity and ambience, which is neither too dry nor too resonant. 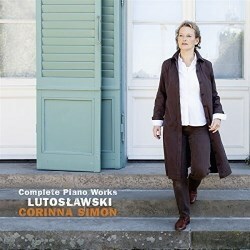 I can heartily recommend this CD to all fans of Lutosławski, especially those who think they know his music. There are enough surprises here to delight one throughout the programme.